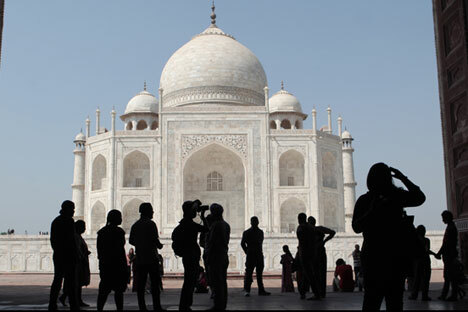 Tourists on the territory of the Taj Mahal palace in the city of Agra. Emulating the Russia-China visa-free tourist exchange programme, Rostourism is planning to put in place similar Russia-India visa-less tourist exchanges. Rostourism is working on a visa-free exchange plan for tourist groups between Russia and India, Valery Korovkin, head of the Department of International Cooperation of the Federal Agency for Tourism, said at a press conference. He was speaking at the Ministry of Tourism in Goa. The existing visa-free exchange programme between Russia and China provides the basis for the new project, but procedures will not be identical. The minimum number of members in the group from India will be reduced to three (for China, a visa-free group must comprise at least five people). Korovkin could not provide specific dates by when the visa-free group exchanges could begin, stating that coordination processes were time consuming. He did say, however, that Rostourism was doing everything possible to make it happen in the next calendar year. To promote tourist traffic from Russia, the Indian Government will consider reducing the cost of visas for Russians from 75 to 60 dollars. Ameya Abhyankar, Director of Tourism, Goa Ministry of Tourism said his office was working to ensure that Russian tourists’ stay in Goa was as comfortable as possible. “Rescue teams who patrol the coast from dawn until midnight are on duty on all Goa beaches. Since they appeared, they have assisted nearly four hundred tourists. There are also full-time cleaners in Goa. Also, a mobile application has been launched allowing travelers to control the quality of cleaning of beaches. Guests can take a picture of the rubbish found on the beach and send the photo to the service responsible for cleanliness. Within 12 hours the garbage will be removed, and, as feedback, the sender will receive a photo of the same spot after it has been cleaned. For women who travel alone, there is a special taxi service, whose drivers can only be women. Such taxis are available for tourists at the airport,” he said. The state government is also constantly expanding the number of tourist activities. “We pay great attention to the development of eco-tourism, and this year, we are ready to offer our guests new routes. We are capable of surprising even the tourists who visit us regularly. Russian tourists still account for more than half of all the visitors to Goa and I am confident that the relief and subsequent cancellation of the visa regime will make Goa an even more accessible and attractive place for Russians,” said Nilesh Cabral, chairman Goa Tourism Development Corporation. First published in Russian by TRN News.